Map showing key archaeological monuments, the tunnel, location of proposed Expressway and National Trust land. We wish to acknowledge the generous support of Amesbury Museum and Heritage Trust for this schematic map which is based on Highways England’s proposal, 2018. What are we trying to save and why? The Government proposes to widen the A303 trunk road to the south west. 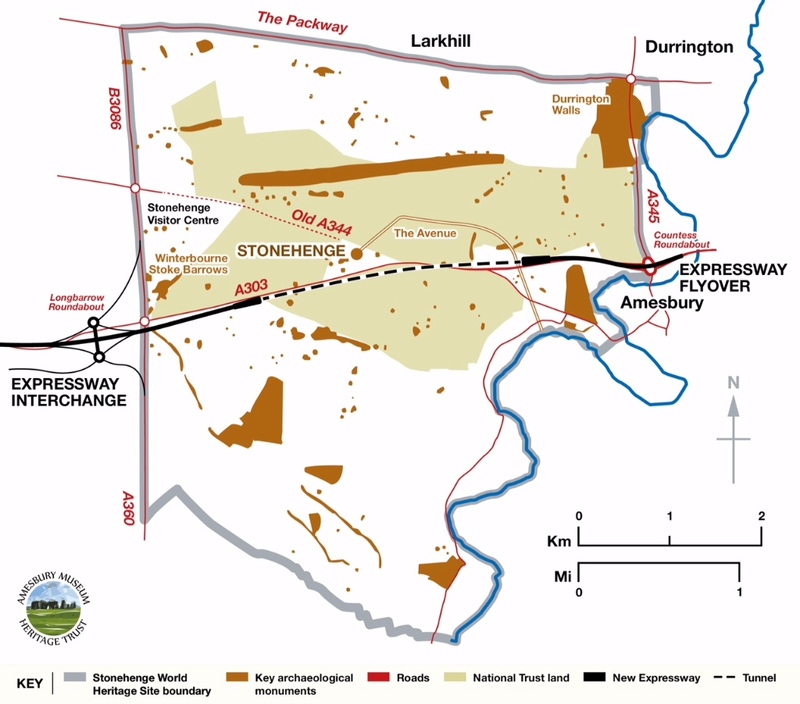 The 4-lane carriageway, tunnel, slip roads and trenches would cross the iconic Stonehenge World Heritage Site (WHS): a landscape that is considered “the most archaeologically significant land surface in Europe without parallel”. The whole Stonehenge landscape has an outstanding universal value that is of immense significance for all people for all time, and this transcends any consideration of sorting out a 21st century part-time traffic jam. The road and tunnel is being sold on a false premise: that it is enhancing “Stonehenge” and the “World Heritage Site”. The triangular field where the stone monument stands is one part a vast prehistoric landscape. Read more. The whole site, extending to beyond the horizons around the famous stones themselves, is c. 5.4 km across. All of it makes up a “huge ancient complex” that holds many secrets yet to be discovered. Yet the proposal is for a 2.9km (1.8 mile) tunnel (see map above). It would result in at least 1.6 km of above-ground 21st-century road engineering within the WHS. All archaeology in the construction zones would be destroyed and the A303 would become the largest ever human intervention in an area fashioned and revered by over a hundred generations of our ancestors. It would cause irreparable damage to the WHS in breach of the UNESCO World Heritage Convention and ignores UNESCO’s firm advice in 2018. Our response to Highways England’s consultations on the A303 Stonehenge in 2017 and 2018 can be read here. We have set up a petition to the Secretaries of State for Transport and Culture. Please can you sign it and share widely? No further damage should be done to the archaeological landscape of Stonehenge. Our responses to several myths explain our position on road widening by Stonehenge WHS. After receipt of the application, there will be 28 days for the Planning Inspectorate to review the application and decide whether or not to accept it for examination. If the application is accepted, we will confirm the timescale within which people can register to become an Interested Party by making a Relevant Representation. 16 November 2018 – Planning application accepted by Planning Inspectorate. The timescale will be published and people can register to become an “Interested Party” by making a “Relevant Representation”. 19 October 2018 – Highways England submit application to Planning Inspectorate. Cost increases to £1.7bn. 8 February to 23 April 2018 – Statutory consultation on proposed scheme. Cost increases to £1.6bn. 12 January to 5 March 2017 – Non-statutory consultation on route option. Cost increases to £1.4bn. 2014 – Scheme included in the Roads Investment Strategy. Budget cost £1.2bn.